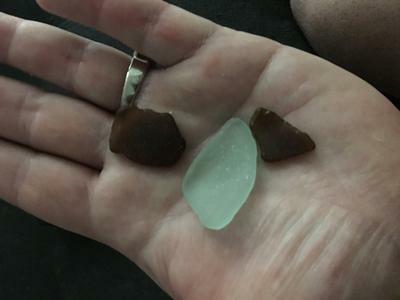 My family and I went to the beach today and found the sea glass you see in the picture. Oh, oh! Now you're going to be wanting to go to the beach too much. You will ignore the (less) important things in life like working, grocery shopping, school, relatives. You have been hooked. On the other hand, it's healthy, right? Sun, sand, sea breeze, salt air.